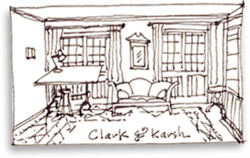 Clark & Karsh, Inc. handles architecture, design, and development projects. Recently completed projects include major residential remodels and new construction in Beverly Hills, as well as remodels of residences in Pacific Palisades and San Francisco. Current projects include design and construction of a residence in Montecito near the San Ysidro Ranch and master planning for a Horticultural Learning Center on eleven acres in Griffith Park. Clark & Karsh has a simple philosophy and mission: design and oversee building of high quality, beautifully detailed spaces that are both functional and enduring. Each project starts with a thoughtfully conceived design, includes a team of the best consultants, engineers, and contractors available within budget, and receives the highest level of attention, expertise, and enthusiasm of Clark & Karsh throughout the process. Clark & Karsh is committed to creating spaces with a true sense of place, and to making both product and process equally satisfying for everyone involved.